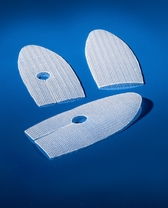 Rigid and semirigid preshaped Hertra® 1, 2 and 2A meshes are used to repair inguinal hernias in open surgery, and are easily and rapidly positioned as a result of their rigidity and shape-memory features. For this reason, Hertra 1, 2 and 2A meshes do not require sutures or other fixing methods, and are the only original means of repairing inguinal hernias by the sutureless Trabucco tension-free method. Hertra 1 and 2 meshes are indicated for male inguinal hernia repairs: the eccentric eye is in an anatomically correct position for the passage of the spermatic cord, and the prosthesis design is the result of hundreds of inguinal canal measurements. The Hertra 2A mesh is used for female or male inguinal hernias in orchifunicolectomy cases.